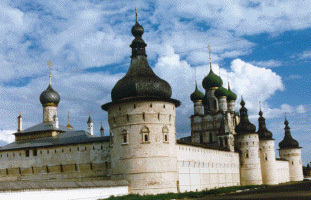 Continuing along the "Golden RIng," route, traveling north from Sergiev Posad along the road to Yaroslavl for another 80 miles, one comes to the city of Rostov Velikii, or Rostov the Great. As one approaches, one is greeted by a spectacular panorama of architectural ensembles on the shore of Lake Nero. Although already settled in the ninth century, most of Rostov's magnificently restored architecture dates from the 17th and 18th centuries. 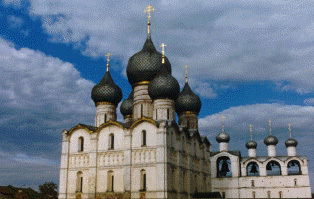 Especially of note are the Metropolitan's Kremlin (photo, top of the page), and the adjacent Dormition Cathedral, with its world-famous Rostov bells (photo, above left). 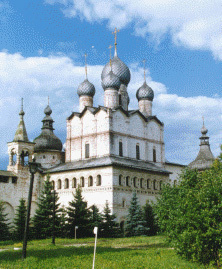 Within the marvelous Kremlin are a host of beautiful churches, such as the Resurrection Church (photo, above right) and other buildings, and a fine museum of icons, enamels and other sacred arts. Today Rostov continues its historical role as the center of Russia's production of exquisite miniature enamel work, both sacred and secular. Either from the street vendors by the Rostov Kremlin, or in Yaroslavl, this is the place to buy gorgeous enamel jewelry and other enamels made in Rostov. While the interior of the cathedral was being renovated in the 1990's, Divine Services were being held in a chapel in the basement of the bell cote.